The Motion Coordinator MC464 represents a quantum leap in motion control technology. Run your machine faster with this new generation Motion Coordinator based on the 64 bit MIPS processor. Choose the motor and drives to best suit your application without compromise, MC464 provides interface options for traditional servo, stepper and piezo control together with many digital interfaces for current digital servo drives. Increase the flexibility of your equipment with support for up to 64 axes of motion control. Trio�s tradition of modular configuration has evolved into convenient clip-on modules allowing the system designer to precisely build the configuration needed for the job. Designed from the ground up the attention to detail is evident. The bright easy to read backlight display makes sure that controller status is easily determined, whilst the single piece metal casting provides an integrated earth chassis to improve noise rejection in the industrial environment. The MC464 supports programs written in TrioBASIC, allowing a smooth upgrade path from earlier series of Motion Coordinator. In addition; G-Code, HPGL and the standard IEC 61131 languages are supported, with full operation of the IEC 61131 language requiring a software license. I/O expansion is provided via a built-in CAN Bus interface. 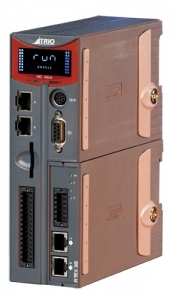 Further fieldbus networks supporting common factory protocols are supported via the HMS Anybus� adapter module. Every axis can be programmed to move using linear, circular or helical interpolation, electronic cams and gearboxes. Features include support for merging multiple moves that are typically generated by CAD/CAM software and support is provided for continuously rotating machinery.